Occasional breaks are fine, but wasting time isn't. When a final exam is bearing down on you, even watching paint dry might seem more attractive than studying. Ignoring your phone, friends and television and getting to work can feel downright impossible. Half the battle is choosing the right place and time to study, and the rest comes down to your ability to concentrate. With some willpower, you'll be receiving high marks on all your finals before you know it. 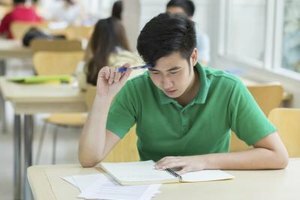 Think about where you've most effectively studied for exams in the past. Some students will be able to concentrate in a packed library, while others can focus only in complete silence. Avoid setting up your books in an area where you'll be tempted by distractions. Don't curl up in your bed or you'll end up napping. Avoid sitting on a couch in front of a TV or near a gathering of friends. Arrange a table in front of a blank wall, or find an empty classroom or distant corner of the library. Gather all of the materials you need so you don't have to interrupt your study session. Try studying in quiet, though you may want to bring an MP3 player loaded with instrumental music in case you need to block out conversations of nearby people. If you eat a huge meal before studying, you'll feel bloated and sleepy; if you don't eat, your grumbling stomach and light head will be all you think about. Snack on healthful foods like peanut butter crackers and fruit before studying. Stow some nuts, cheese sticks and granola in your bag for a study break. Bring a bottle of water and a caffeinated drink, if necessary. Your clothing can also affect your ability to concentrate. Change out of tight clothes and wear loose jeans or sweatpants and a few layered shirts on top so you'll be able to adjust to the temperature of your study space. Studying seems less daunting when it's broken into small pieces. You'll be less likely to give in to distractions every few minutes if you know you have a study break coming up. Write out a schedule laying out what you're going to study, when you're going to end and when you're going to take breaks. Try scheduling a five-minute break after every 20 to 30 minutes of studying, or break for 15 minutes every hour. Use a timer to keep track of your study and break times. Start with the most intimidating studying tasks first to get them out of the way. When you're scheduling study time, think about what time of day you feel most energized and focused. Even when you're isolated from external distractions, your mind will wander at some point during your studying. 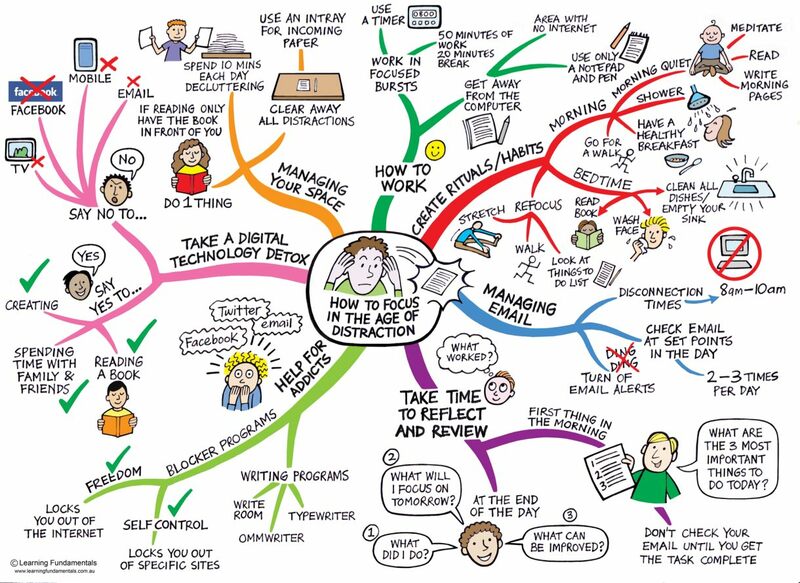 Learning to deal with these distractions allows you to dismiss them quickly and get back to work. Keep a notepad nearby. If something occurs to you that you need to deal with or look up later, jot it down so you can forget about it. When you find yourself simply daydreaming, try closing your eyes, breathing deeply and clearing your mind, or repeat a mantra like, "Come back to focus," or "Get an A". If you can't shake the daydreaming, take a few minutes to stretch your muscles, or switch to studying a different topic. Walsh, Kathryn. "How to Stay Focused While Studying for Finals." 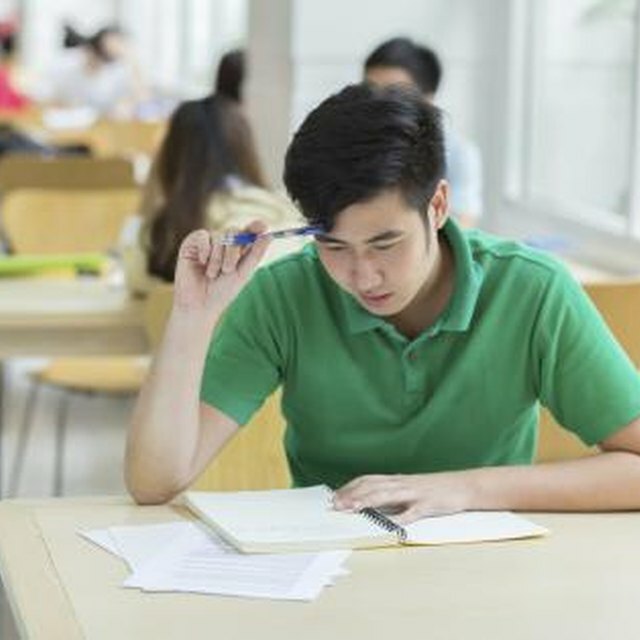 Synonym, https://classroom.synonym.com/stay-focused-studying-finals-4271.html. Accessed 19 April 2019.